Although my spouse and I have done well financially, there are things I wish I had done differently! Here are some of my financial mistakes. I hope that by sharing these with you, it will help you to learn from my mistakes. I picked the wrong college major. My parents scrimped and saved for years to send my brother and I through state university. What a wonderful gift it was, but I wish I had been wiser in using it. Starting college right after high school, I had no clue about which careers I should consider. I did not take advantage of either high school or college counselors to help figure it out. Instead, I picked my major based on the courses I enjoyed – without considering how that major would help me earn a living. I ended up with a BA in Psychology with an emphasis in Industrial Psychology – and couldn’t get a good paying job of any sort after graduating! Don’t be afraid to dream big for the life you want to live, but make sure you can afford it. Investigate how you will earn a living in the field you choose before you spend years and tens of thousands of dollars pursuing a degree in it! Ten years after I earned that BA, I was back in community college earning credits to become a computer programmer – a field I did research beforehand and one which provided ample returns on my time and money investment. I refused to accept offered help. Parents typically want their kids to do better than they did, and often try to help out. My Dad offered my spouse and I the opportunity to buy his starter home (which he had converted to a rental) at a very attractive price. I was too stupid and stubborn to accept that offer! Over the years, I made it pretty plain that I was going to stand on my own two feet and not accept parental help. It would have pleased my folks if I had accepted and it would have helped our finances out too! Its good to be independent, but don’t overlook opportunities presented to you! Negotiation was not a skill that I learned. I didn’t know how to negotiate and I felt that negotiating was bad to do – almost cheating. Consequently, I overpaid for cars and real estate my entire life and I let others underpay me for my services. Learn to negotiate and practice it every chance you get! I didn’t leverage my money well. My spouse is a veteran. We could have bought a house using a zero down VA loan after his service period in the 1970s, but we waited 5 years to buy and paid a full 20% down. We bought at a time when interest rates were at a high. I also wish that we had taken on loans to buy investment property after we got financially established after our first 15 years. If you have built a solid base of operations, consider leveraging your money by investing in real estate or other opportunities that come your way. Although we kept our automobiles for 8 – 10 years, I bought most of them new AND never dickered with the car salesman. The only used cars I’ve had were the first one when all I could afford was used and the one I have now, which was a year old when I purchased it. By purchasing used vehicles you save on the initial car price, the sales tax you pay upon purchase as well as the property tax you pay each year and the amount you need to insure it. I saved to send kids to college first, before retirement. Although it turned out OK for us, conventional wisdom says that your kids can get loans to go to school, but you can’t get loans to live in retirement. I really didn’t start socking money away for retirement until I was in my mid-forties – but then I put in as much as possible and was able to play catch up. What have you learned from financial mistakes? Don’t feel bad. My husband earned his first bachelor’s degree in theatre arts! Try getting a good-paying job with that! He had to go back to school too and earned another bachelor’s degree in mortuary science. That is interesting. What sorts of jobs are there for a mortuary science major? Hindsight is always better. If you did well enough, then you probably did more things right than wrong. College, BTW, is a place to get educated, not trained. That our culture has lost sight of this fact is not a reason to lose sight of it oneself — as you note, it’s always possible to go on to a community college for a vocational degree or certificate. 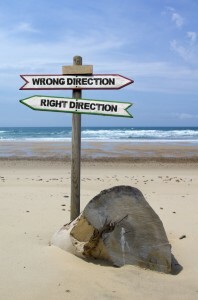 Doing more things that right than wrong is the trick – and it usually comes at the cost of your mistakes!